Christopher Lucas with his painting of Avatar Grove. Oct. 16, 2013 8:00 a.m.
A sense of wonder at the wilderness and the weather has led Christopher Lucas to canvas and paint. He is intrigued by nature and specifically the great outdoors close to his home in Shirley. It’s all brand new work and Lucas is mounting 25 paintings in acrylic and watercolor. His subject matter is the forest, ocean and the waves present in the wild landscapes of the Juan de Fuca. Lucas’ paintings can best be described as exuberance splashed by colour. The faintly abstract works evoke a state of mind more than actual scenery. Many seem to be draped behind a curtain of rain. Lucas came to Shirley via Edmonton in 2009. He immersed himself in the community he loves and along with his art studio he is a fire fighter and is training to become a paramedic/ambulance driver. 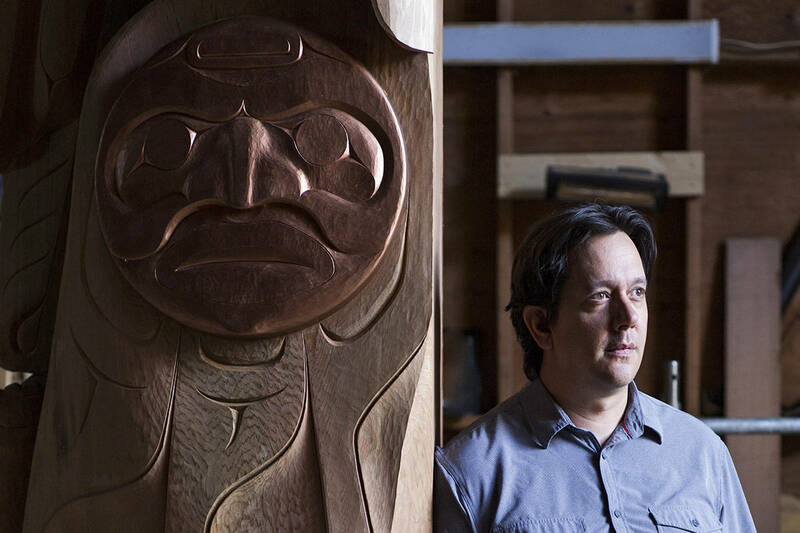 His art training is in architecture (Humber College) and the University of Alberta arts extension program along with courses at the Victoria College of Art. He had an art gallery in Edmonton for 10 years and estimates he has painted over 4,300 pieces. His work has been present at the Shirley Farmers’ Market and he had a previous show at Gallery West. Gallery West is an extension of the South Shore Gallery at 2046 Otter Point Road.